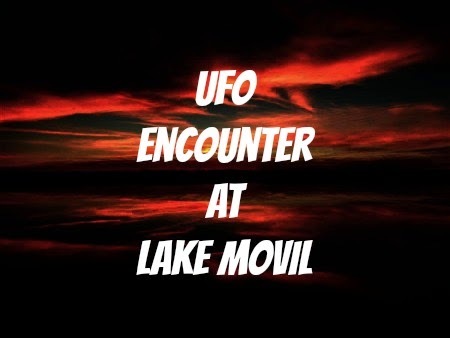 The following is the account of Marilyn Chenarides and Mrs. Mildred Anderson of Grand Forks, North Dakota, who had an unusual experience while vacationing at their cabin on Lake Movil in northern Minnesota. Mrs. Lorenzen contacted Mrs. Chenarides and asked her cooperation in doing an artistic rendering of what they had seen. Mrs. Chenarides and her mother were most cooperative, and the drawing above by Staff Artist Brian James represents what they observed. The exact date cannot be recalled but it was an August night in 1962 when Mrs. Anderson was doing her daughter Marilyn's hair. Marilyn's younger brother, Roger, was in bed. Suddenly Marilyn became aware of an odd object outside, and both of the women stared out the window at a red glowing object which was hovering over the boat dock 50 feet from the cabin. The light from the object made the green painted boat dock appear brownish in color and the water a greenish-black. The side of the object toward the cabin had three windows which were lit up by a yellowish light and in two of the windows the women could see the silhouettes of three man-shaped beings. The object was hovering over the near end of the dock and appeared to be 8 feet high and 35 feet wide. Both of the women felt that the "men" were watching them and after a few minutes of observation, Mrs. Anderson switched off the lights in the cabin, whereupon the lights on the object immediately went out. Mrs. Anderson then had an irresistible impulse to approach the object and threw open the door and started running down to the boat dock while her daughter, almost hysterical, screamed for her to come back. When Mrs. Anderson was halfway to the dock the object lifted slowly in the air, then moved off at an angle and was gone as suddenly as it had arrived. The object, when first seen, seemed to appear out of nowhere. When it extinguished its lights when Mrs. Anderson turned off the cabin's lights, it was a dark blob over the dock so it may be assumed that the object could have been there for some time prior to Mrs. Chenarides' first glimpse of it, and it was called to her attention by the lights being turned on. Mrs. Chenarides also described an incident which had taken place three weeks prior to the "occupant" sighting. She, her mother and father (Mr. and Mrs. Kenneth Anderson) and brothers Duane and Roger and the family dog Zipper were driving about 125 miles from their home to the cabin. When they were about 12 miles out of the town of Bagley the dog began to growl and Mr. Anderson spotted a large, green luminous object which appeared to be approaching them on a parallel course. Mr. Anderson said the object wasn't going very fast and he slowed the car and the object passed them. It was approximately 70 away from their car and appeared to be about the height of a two-story building. It appeared as a long oval, yellowish-green in color and with a haze or fog around it. After the object passed the Anderson car Marilyn and Duane watched it out of the rear window until it had passed out of sight. Duane said that they could see the thing hovering over a bare patch of land for a while, then it moved over a wooded area, made a half-circular maneuver and disappeared into the woods. They continued to watch but the object was not seen again.